Every Friday I will be posting tips to support you in connecting more effectively with your colleagues nationwide in the Hello community. 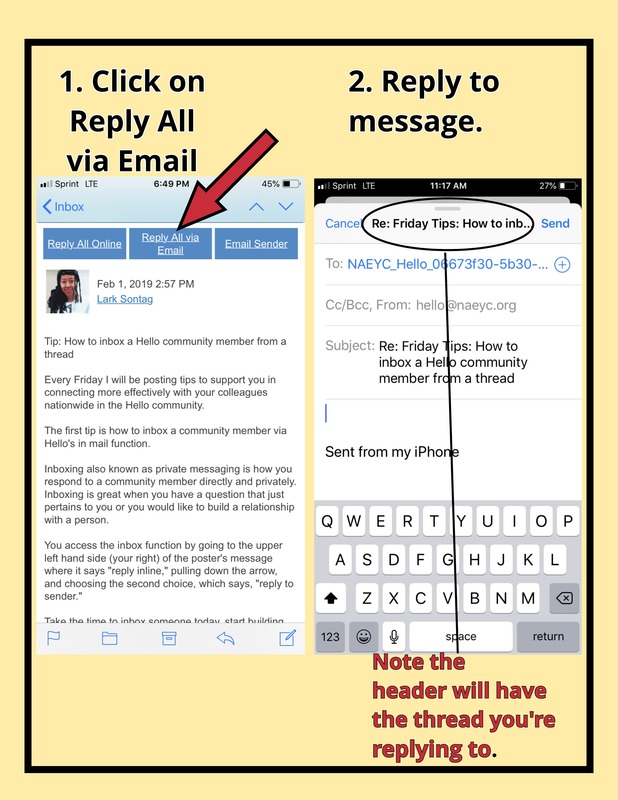 The first tip is how to inbox a community member via Hello's in mail function. Inboxing also known as private messaging is how you respond to a community member directly and privately. Inboxing is great when you have a question that just pertains to you or you would like to build a relationship with a person. 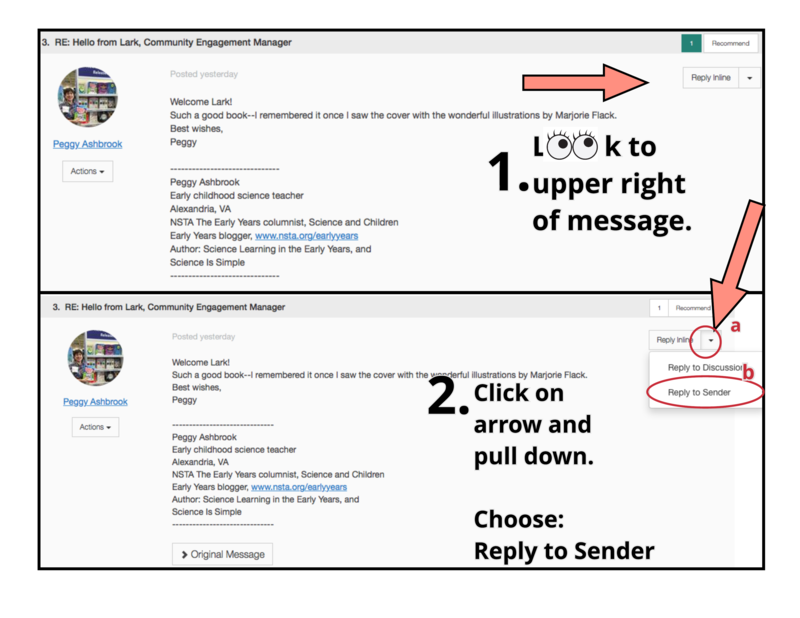 You access the inbox function by going to the upper left hand side (your right) of the poster's message where it says "reply inline," pulling down the arrow, and choosing the second choice, which says, "reply to sender." Take the time to inbox someone today, start building your network by introducing yourself to a person you've never met in person before. Let us know how it goes by replying to this post. 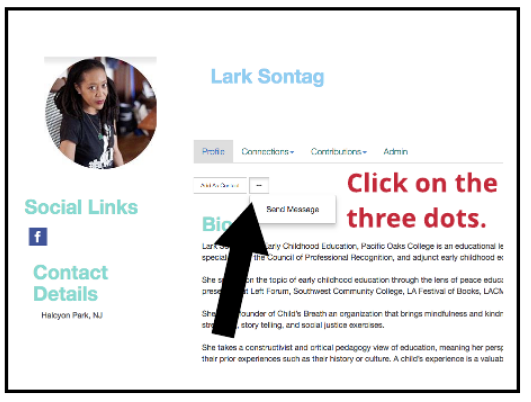 There are three ways to do this --by hovering over their name in a discussion thread, by clicking on their picture and going to their profile, or by searching for them in the Hello Contact List. 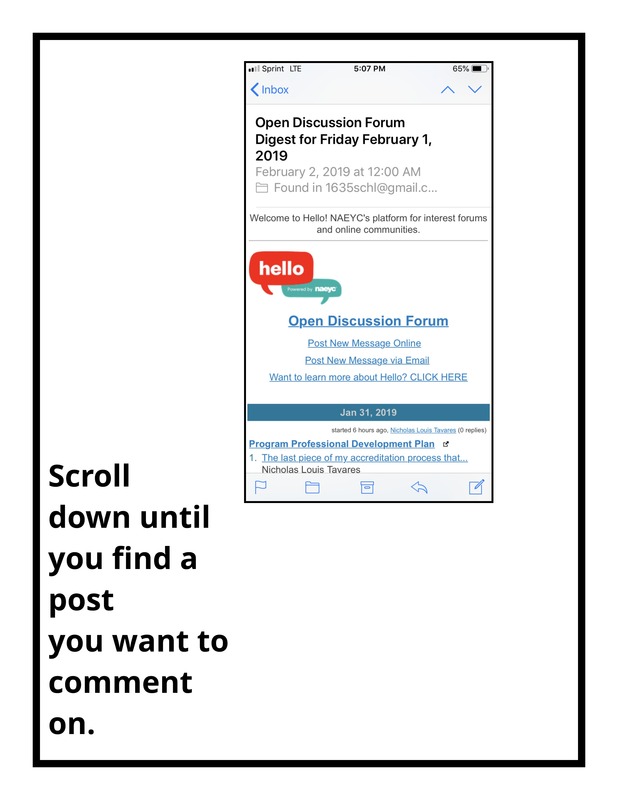 Go to a member's profile and hover the cursor over their name when it appears in a discussion thread. The request contact and send message options should come up, choose message. Click on the person's name. You will see add contact and a box with three dots. Click on the box with three dots. 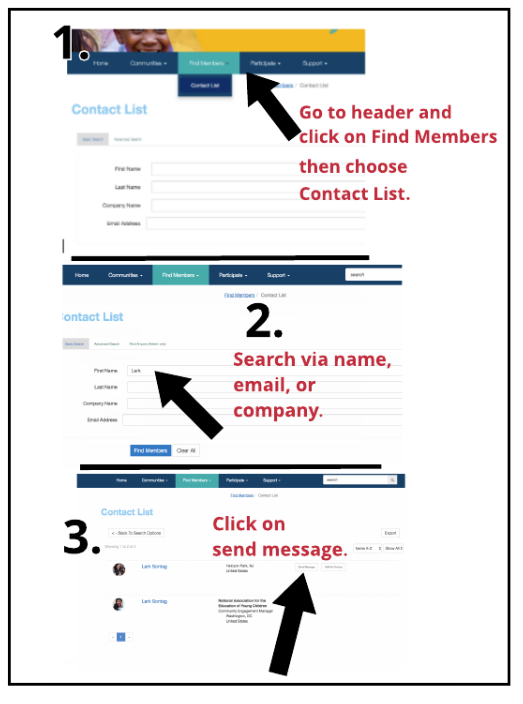 If you don't see the person on a thread, but you know they are on Hello go to header and click on Find Members, then click on Contact List, and do a search for their name or email. When their name comes up click on send message. Start building your network. Take some time to tell a community member Hello. Let us know how connecting to other members goes by replying on this post. We are all super busy. I don't know about you, but I typically access my email on my phone. Can you do this on HELLO? Yes, of course and there are two ways to do this -by pressing reply all via email on the top of the message or by pressing reply all via email at the bottom of the message. Scroll to the message you want to respond to and hit reply all via email at the top of the post. Scroll to the message you want to respond to and hit reply all via email at the bottom of the post. Start building your network. While you're checking your other social media, check us out too. Let us know how it goes by replying go this post on your mobile phone. When I read the discussions in HELLO each day, I enjoy the sense I'm interacting with both known and rising leaders in early childhood. 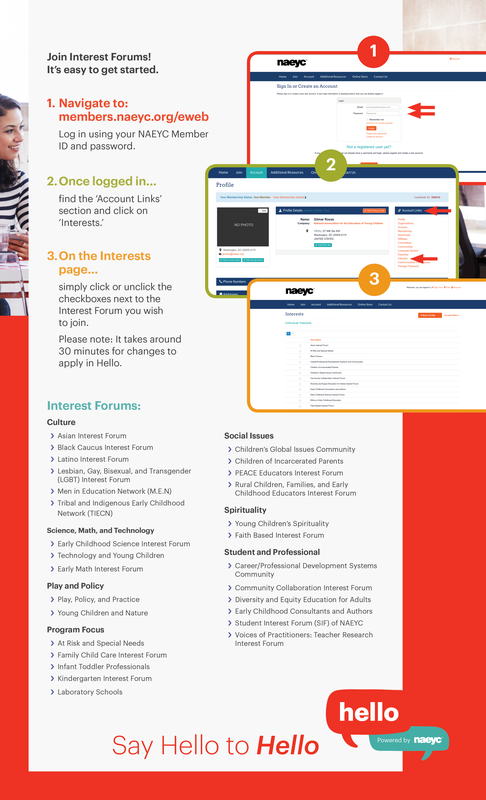 One route to leadership is to join and become active in one of NAEYC's Interest Forums. Interest Forums provide the opportunity to become well-versed on a particular topic and are a proven way to get involved as a leader. In the last two years alone, several members of various governing boards have served as Interest Forum facilitators. As a member of an Interest Forum you get to dig deep in an interest area, present at conferences, lead discussions, and support your colleagues through discussions here on Hello. So, some of you might be wondering, "How do I join an Interest Forum?" It's easy! 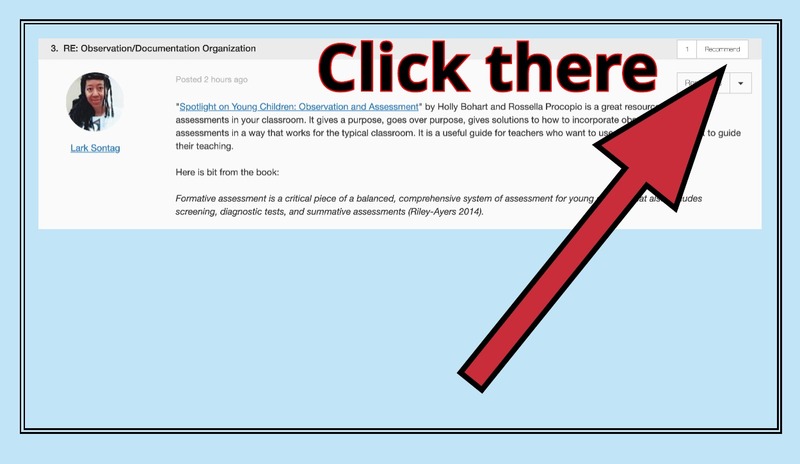 Simply join through your NAEYC digital profile. First, go to the right sidebar on your profile. Find the Account Links section and click on Interests. Once on the Interests page, the Interest Forums will come up in a list. From there, you can select as many forums that interest you. Then scroll down to save your choice(s). In a few short weeks you'll get a notice letting you know you're a member. Facilitators! What are some of your favorite benefits of being a member of an Interest Forum? It is always wonderful to be able to say hello to people in real life who I have only seen virtually. One of the best benefits of HELLO is the potential for real life connections. A simple way to put a face to your wonderful conversations on Hello is by adding a profile picture. So, some of you might be wondering, "How do I get my picture in my profile?" First, go to the gray circle in the upper right corner of the Hello homepage. When you get there, click on the down arrow. Then choose and click Profile. Once you arrive to your profile click on the down arrow to the right of Actions. Then choose Add (or Change) Picture. Then click the property (your computer, Facebook, Dropbox…) to upload your picture from. The last step is clicking Save. If you have not added your picture yet, add one and show us the person behind your words. We have many members on HELLO who give great advice. Have you ever posted on Hello and wished that person who gave an amazing resources on that other post would help you out on your question? Have you ever wanted to acknowledge an idea? Have you ever wanted to expand on a topic and wanted others to join in? There is a way to tag a person on your posts on Hello. Type "@" in front of the name of the person you want to tag. "Thank you @Aren Stone and @Shari Doherty for sharing the Adverse Childhood Experiences resources on the Expulsion thread, that was helpful." "Thank you @Lorraine Breffni for your wonderful post on staff engagement." "Thank you @Temesha Anjel Ragan and @Shannon Susan Green for sharing your moonshots, those were wonderful." "Members who knows about business plans, can someone support @Tamisha Sewell with learning about writing her business plan?" If you want a person to know you need their help or you just want to tell them thanks for being awesome @ them, so they "hear" it. Like all discussion spaces on the web, HELLO relies on a code of conduct to guide members interactions with one another. This is something that users agree to when they first log into Hello. This code ensures that the discussions remain free of commercial messages; that partisan political messages do not interfere with NAEYC's tax exempt status, bipartisan outlook, or diverse membership; and that controversial topics in the field are discussed with civility. The vast majority of the over 6,000 posts on the 1156 conversation threads on Hello focus on issues in early childhood and supporting practitioners in their work. 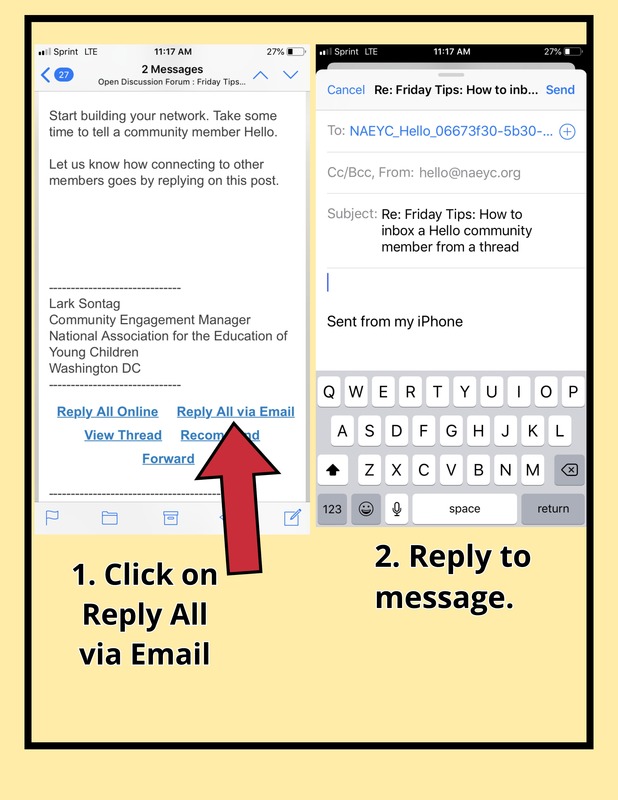 NAEYC staff monitor the discussion board and on occasion we do ask someone to edit a post. Since the majority of those who post have never had a post edited or rejected, we'd like to be transparent about our process for when we do. We do not remove posts because we disagree with an opinion. We remove posts for infractions of the code, which include use of candidate campaign slogans, engaging in personal attacks, or for promoting products or services, among other reasons. We only remove posts after careful review and our process always involves consideration by at least two staff members. We also prefer to edit a post whenever possible rather than delete it. When we remove or edit a post we let the poster know and we always encourage them to post again on the topic in a manner that aligns with the code of conduct. The most common form of edit has to do with a post that links to content on a another website. The code of conduct prohibits posts to commercial sites. This includes linking to Amazon or other book retailers While we allow links to free, helpful resources (such as blogs) we want to make sure that the link provided is relevant to the discussion at hand and offers some narrative about the content of the link that is useful in and of itself to the Hello community. In other words, if you want to link to a free resource on a site that also sells things, you need to make it clear in our post why that resource is relevant to the discussion. In the end the code of conduct is intended to foster respectful discussion on a wide range of early childhood topics among a diverse group of NAEYC members. Based on the topics covered this week (staff labels for power to the profession, aggressive children, ideas for engaging families in math) we think we are monitoring in a way that is fostering respectful discussion. Thanks so much for contributing by posting a question, responding, and reading. 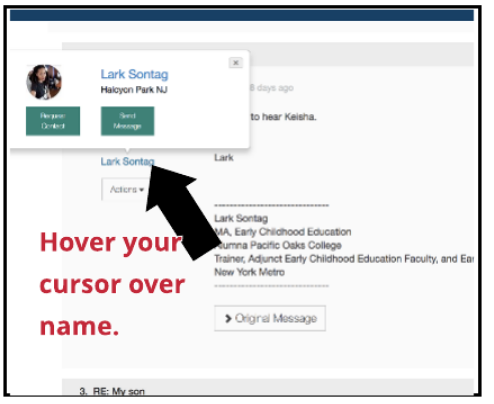 When you first sign into Hello, you are given a default signature that includes your name, job title, company, and location based on your NAEYC membership profile. But did you know that you can change your signature on HELLO at any time? 1. Navigate to Post A Message, then scroll down to the end of the message and you'll see a second smaller box. When you get to that box, click Edit Your Default Signature. From there you see the field where you can edit your signature. 2. Take a look at your signature, is it showcasing who you are properly? Maybe you need to update your company information, or you'd like your location to reflect where you work instead of where you live. 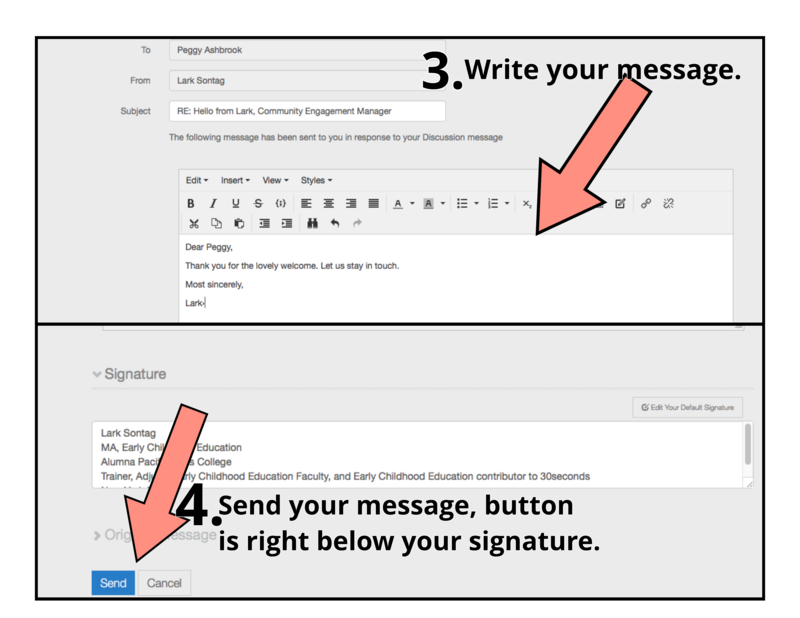 If the default information needs to be updated, change it to a signature that properly reflects who you are. 3. Have a great Friday! Did a post on HELLO give you a useful resource? Did a member share an answer that helped you with a challenging situation? Recommend their post. It is easy to do. When accessing Hello on your laptop or desktop the right hand corner of every post and reply has a recommend box. Click on the box to show that you appreciate a post or comment.